Enrolling properly is crucial to having the best possible start at Western Sydney University. This page is your checklist to make sure you've completed all the steps. 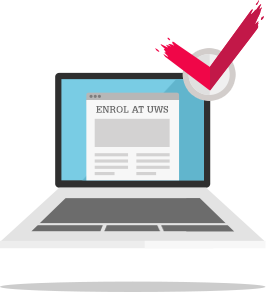 Enrolling properly is crucial to having the best possible start at Western Sydney University. The steps you need to follow are outlined in the 'How do I enrol?' webpage. You should use those steps as a checklist – complete them in order and tick them off once they're complete. How do I know if I am enrolled properly? Go to 'MyStudentRecords' (MySR). Go to the Enrol section and select the relevant course. Then select the Specialisations and Units step from the left hand menu and check that the required Units have a status of 'ENROLLED'. If you have a unit/s under the heading Unit Selection Cart (Unconfirmed Changes) you are not enrolled in these units and need to complete the unit enrolment process. OR, Log into your student email and look for an email called 'Enrolment Receipt'. This is a receipt that tells you what you have successfully enrolled in. If you don't have this email within 24 hours of enrolling, then you haven't enrolled properly. If I haven't enrolled properly, what do I do? The My Student Records (MySR) system assists you to enrol by making sure you have completed each step correctly before you can progress to the next one. Contact Student Central on studentcentral@westernsydney.edu.au or 1300 668 370. Every time you change your enrolment, you will receive an email confirming the changes you made. These emails go to your student email address, so make sure you’re checking it regularly.